We need non-expert voices in the room. No individual expert knows everything, many decision-makers are themselves non-experts, and considering stakeholders’ voices leads to more legitimate, relevant and viable policy outcomes. Significant improvements in the prevailing condition require disruption of the status quo. The status quo implicitly extends from the status quo ante, the prevailing norms that preceded the current state of affairs and on which the structures we know were founded. Expertise is rooted in an examination of these two states, and can provide a sound and reasoned reference for how to move into the future, but when we look to achieve a post status quo reality, where human conditions are greatly improved and the previously unavailable has become commonplace, we have to recognize that we are looking beyond what is known. Expertise unaccompanied by the power of imagination and a hot contest of ideas can lead to planning not well adapted to visualizing, comprehending or catalyzing disruptive optimizing change. Any human being knows more about her own local experience than someone who has never been there. How do we know what people live? Ask them. The non-expert voice may not know that one should not demand the ideal. In discussions that touch on issues decision-makers have come to see as too knotty—for very real, but not definitive, reasons—people who only see a problem still waiting to be solved will focus attention on solving it. Stakeholders, if allowed to speak, will demand the unresolved be dealt with. Think access to health treatment, education, clean water, mine-clearing or peacekeeping forces. Experience of the status quo ante often tells the experienced that any attempt at the ideal inevitably falls short. While this is often true, someone has to make the attempt, so that our imperfect achievements are oriented toward achieving as much progress as possible. There are crises that are persistently difficult to cope with, but which require disruptive optimism nonetheless. The optimist is not the fool who sees all and only through rose-tinted glasses; the optimist is the rational actor who is insistent enough on rational action to aim for the best outcome within the realm of the possible. The optimal, while within the realm of the possible, may actually remain beyond the reach of all that we yet know. Closed spaces for discussion of ideas are inclined to incomplete thinking. No expert knows everything we need to know about past, present, and future, much less about as yet over-the-horizon shifts in the landscape. If we limit the number of minds available to the task, then limit the kind of thoughts those minds are supposed to prefer, then limit the language through which they are allowed to express their ideas, the field of information exchange will be limited, though the stakes may be global and existential. Many powerful decision-makers are themselves non-experts in fields where they are required to make resonant executive decisions. How do they learn all they need to know about the existing landscape of possibility? The non-expert might be a generalist with deep intelligence in many subjects, someone who is expert in another area, or even a novice with a fresh view. If advisors are drawn from multiple disciplines, some will be seen as non-expert (the ecological integrity of the water cycle is not always seen as germane to national security discussions), but the resulting multidisciplinary outlook will give decision-makers a much better view of the landscape. Including stakeholders gives us the added benefit of direct information about lived human experience. When we plan 195 national strategies to build low-carbon economies, we enter into a process without precedent. There are many capable minds with much experience, but no expert in what is to come. To see into the terrain where disruptive change emerges, we need to look beyond the bounds of standard discourse. We can inhabit the landscape of expanded possibility where disruptive optimizing change occurs, if we commit to a process that is open, collaborative, ongoing, and boundless. 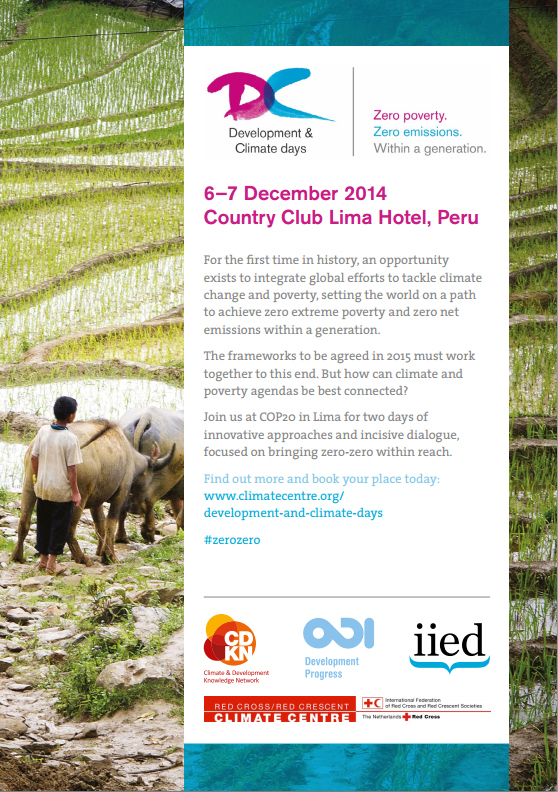 The featured image at the top of this article was taken at the Development and Climate Days conference, on the middle weekend of the 20th Conference of the Parties (COP20) to the UN Framework Convention on Climate Change, in December 2014, in Lima, Perú. The photo shows the interior of a giant quilted balloon, made of scraps of plastic, on which visitors were invited to write their testimony on the importance of sustainable development, climate action, shared responsibility, and imaginative cooperation for the betterment of the world. A spontaneous community of debate and information exchange happened on the inside. On the outside, the designers informed us, repeatedly, “You need to go inside; it will seem very different from the inside.” They were right. Decisions are made by those who show up, who have a seat at the table; stakeholders belong there; our decision-making needs to be multidisciplinary, or we will not see the world clearly from both inside and outside.